The blend is known for its anti-inflammatory benefits. “Unlike the traditional kind, Israeli couscous is toasted rather than dried, which gives it a nuttier flavor and slightly chewy texture,” explains Philadelphia-based recipe developer Robert Luessen. Za’atar contains a mix of spices such as thyme, oregano, and sumac, which can keep skin clear and glowing. Try the dish with your favorite lean protein such as chicken, salmon, tofu, or a six-minute egg, suggests Luessen. In a large skillet over medium-high heat, warm the olive oil. When shimmering, add kale and arugula; season with salt and pepper. Sauté until kale is wilted and arugula is cooked, about three to five minutes. Add lemon juice and zest and stir to combine. Remove from heat and allow to cool. 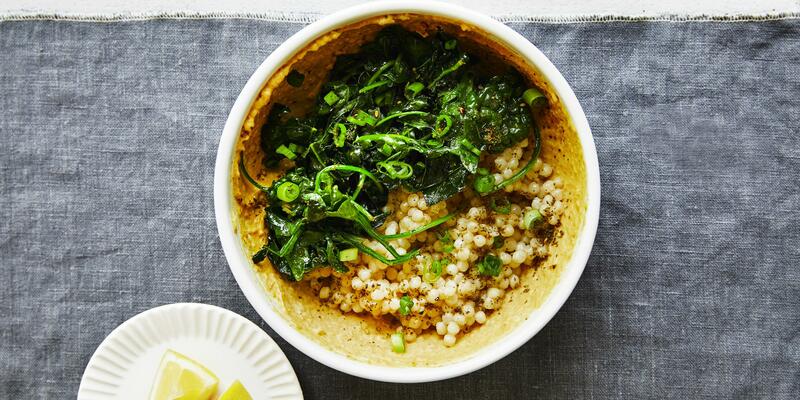 In an airtight container, top couscous with arugula-kale mixture and scallions. Place hummus and Za’atar in two separate containers and store everything in the fridge. Spoon hummus on the bottom and sides of a bowl then add in the couscous, arugula, and kale mixture. Top with Za’atar.